The computer science in education movement is in full swing across the U.S., and to no surprise, there is an abundance of CS gadgets and devices throughout the Expo Hall at FETC this year. When most people hear the words computer science education, they think about large dimly lit computer labs with students staring into screens for hours. However, many CS tools are now hands on, allowing students to work on coding projects away from a device screen. I would like to highlight 2 tools for you that, in my opinion, blend the ideas of MakerSpace Education with Computer Science Education. If you are at the FETC conference, I highly recommend you check out their booths! I do want to specify that I was not asked or endorsed by these companies to highlight their products. Kibo by Kinderlab Robotics Booth 2312: Kibo is a robot for early childhood classrooms. Students add wheels and other components onto the wooden robot base. The kids then sequence wooden blocks together to program their robot to complete tasks. To add a personal and artistic touch, students can record 3 different phrases and add their own artwork to Kibo to help tell a story. Bloxels Booth 1059: Bloxels is a game making tool that you plan and create with your hands. It works by placing small colored cubes into a gridboard. The colors represent different objects that will be mapped out in a game: for example green is the ground, and yellow is a coin or obtainable object. After the student completed their map on the grid board, they snap a picture of it with their device through the Bloxels Builder App, and it is turned into a video game. The students can further customize the game from that point if they desire. Of course there are many other great CS Education booths present at the Expo Center, these are just two that I chose to highlight. 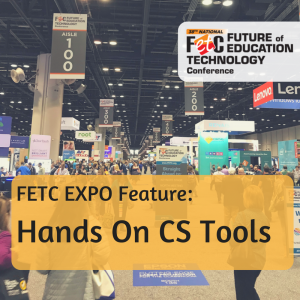 If you wish add a comment below on other CS products that you have seen at FETC or use in your classroom!